The Permanent Peoples Tribunal (PPT) is the successor to the Russell Tribunal which investigated American war crimes in Vietnam. Set up in 1979[i], its aim is to “make up for the moral and political shortcomings of states as instruments for the achievement of justice”[ii]. Last week, at the end of its second session on the Lankan war, the PPT concluded that Colombo is guilty of ‘crimes of genocide’ against the Tamils and that ‘both the United States of America and United Kingdom were complicit in the genocide while the involvement of India warranted further investigation’[iii]. According to the Rajapaksa version, the Fourth Eelam War was fought – and won – as an autarkic enterprise, with some help from a handful of non-Western allies. In reality, the Rajapaksa regime defeated the LTTE thanks partly to an enabling international environment created by the LTTE. In the early, heady months of the Third Peace Process, most of the world was the Tiger’s oyster. The LTTE was welcomed and treated as an unofficial government in many of the world’s capitals. Had Vellupillai Pirapaharan been a little less maximalist, and a little more intelligent, he could have won a federal or even a confederal deal for the Tamils. But moderation was viscerally alien to Mr. Pirapaharan. He wanted his own state and he wanted to win it on the battlefield. Consequently, the Tiger did not really change its ways and act in accordance with internationally accepted norms during the peace process; it only pretended to do so. Behind a façade of moderation, the LTTE continued to prepare for the next war, conscripting children, murdering political opponents and extorting money (even in Western capitals). For a long time, despite concerted efforts by national and international human rights organisations (the UTHR, the Amnesty International and the Human Rights Watch) to expose Tiger crimes, the West opted to give the LTTE the benefit of the doubt[iv]. And the Tigers believed – wrongly – that denials, promises and pretences would suffice to satisfy the world. In the end, despite obvious reservations about the Rajapaksas, not a single country was willing to do what India did in 1987 to save the Tigers. No major international actor was wholly unhappy about the intransigent LTTE being removed from the political scene. So instead of giving ultimatums, as they could have done, they made polite requests – and when the Rajapaksas refused, shrugged their collective shoulders and looked away. The Tigers learnt, too late, that international public opinion cannot be flouted with impunity forever. International repercussions do not come with the suddenness of a tsunami. They happen like a slow process of erosion; each crime, each lie, each unfulfilled promise eats away a few more inches of one’s standing ground. By the time quantity becomes transformed into quality and the realisation that one has really become an indefensible islet in a hostile sea sinks in, it is too late. That was what happened to the LTTE. It might well be the fate of the Rajapaksas. According to Minister GL Peiris the regime spent Rs. 59million in 2013 on its unsuccessful battle in Geneva. Not learning from mistakes is truly a Rajapaksa forte. In 2014, Sri Lanka is set to follow the same failed modus operandi. Minister Peiris will travel the world; many will go to Geneva; the same unctuous mix of denials, assertions and promises will be proffered to the UNHRC. The Bremen Tribunal’s is likely to forward its conclusions to the UNHRC for its next session. So will the ACF, which compiled its own report about the murder of its aid workers in Mutur, after waiting in vain for seven long years for Rajapaksa justice. The killing of the 17 aid workers was one of the worst attacks against humanitarian workers in the world. 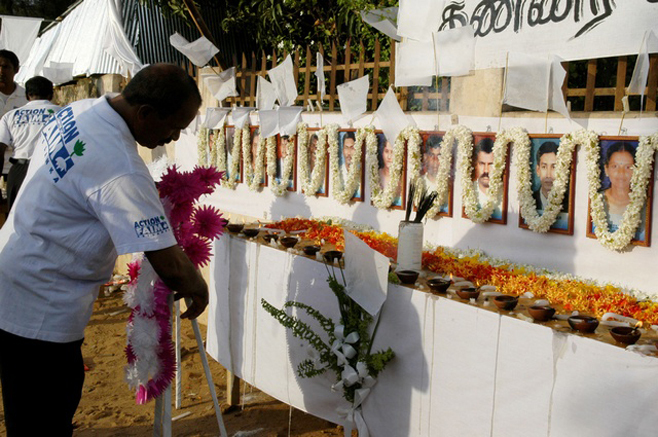 The killing happened at the onset of the Fourth Eelam War, in the midst of an uncouth politico-propaganda campaign by Sinhala-supremacist acolytes of the Rajapaksas against all INGOs. As the UTHR pointed out, “One thing is certain about the ACF killings. They would not have happened if minimally, timely disciplinary action had been taken against SP Kapila Jayasekere once his role in the Five Students outrage (Jan 2006 killing in Trincomalee) became widely known. Instead he was promoted to SSP in July 2006”[vi]. Indeed; had the government carried out an impartial investigation into the Trincomalee killing, the Mutur tragedy, with all its adverse consequences, could have been avoided. By enabling the covering up of the first crime, the road was cleared for a second and a far more devastating crime. By not taking action against the Trincomalee killers a message was sent down the line that targeting any Tamil is ‘kosher’ since most Tamils are somehow, in someway akin to the Tigers. The Muttur massacre was a clear case of extra-judicial murder. The victims were not armed Tigers but unarmed and peaceful citizens of Sri Lanka. The government had plenty of time and opportunity to carry out its own internal investigation. It failed to do so, not comprehending that the resultant denial of justice to the victims and their families was far more damaging than the initial crime itself. If, as the regime claims, the Mutur-culprit was the LTTE, then it should not fear an investigation, national or international. But if the culprits are Lankan soldiers then they must be brought before the law. Not doing so damages the reputation of the country and the armed forces. Sri Lanka and her military deserve better. The Rajapaksas, by their crimes and misdeeds, are turning the world public opinion against them. In the West they have no allies either among right-wingers or left-wingers, reactionaries or progressives. From Washington and Ottawa to London and Paris, their fortunes will not improve irrespective of which party is in office. Their prospects seem similarly dismal in India. Recently, the BJP accused the Congress of being soft on Colombo[vii]; obviously the Rajapaksas cannot expect a major thawing in Delhi, irrespective of who wins national elections. Tony Abbot is the exception, and he is being ridiculed for being “showered with gifts from President of Sri Lanka during the Commonwealth”[viii]. Rajapaksa-Sri Lanka is no Vietnam or Cuba. The Siblings look more like village thugs/bullies rather than some modern day David. While the Tiger was around, they looked a bit better, by comparison. As the memory of the Tiger fades with time, the unsightly deeds and the unseemly attributes of the Siblings are thrown into sharp relief. Not a sight to win hearts and minds. [iv] If the LTTE had ceased at least some of its more execrable practices, such as child conscription, the EU and the Canadian bans may not have happened.